Why He’s A Babe: His name is fun as hell to say, he’s got a killer smile, and we’re suckers for burly bear cuties. 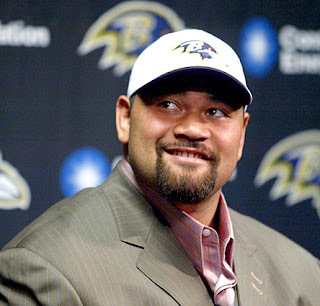 Ngata is one helluva defensive lineman for the Baltimore Ravens, who boast the NFL’s #2 Defense (second only to you-know-who). If he didn’t seem so sweet, we’d be pretty scared bumping into him on a bad day, but since we aren’t on anybody’s O-line, we think we’re pretty safe. All this said and done, though, I gotta pray that on Sunday, Ngata turns out to just be a pretty face, and totally wusses out while facing off with my Steelers for the AFC crown. Ngetoutta here, Ravens!